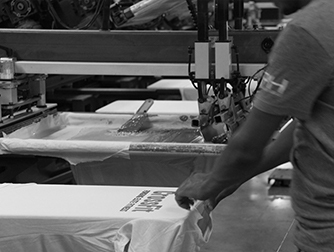 Pinehurst Manufacturing is one of the new breed of super-vendors to the apparel industry. The company creates “apparel from start to finish” in the Western hemisphere, providing the right product at the right time to today’s most successful global brands and retailers. Founded in 1989, Pinehurst Manufacturing was acquired by in 2013 by Heritage-Plastics, a multi-million dollar, domestically-owned manufacturer of mineral-based polyolefin compounds and calcium carbonate concentrates. In 2016 CEO Justin Jones and CFO Martin Lowe brought Uwe Heintel on board to lead global sales, business and product development for Pinehurst, propelling this rapidly-growing company into the new era of apparel sourcing and manufacturing. With more than 1500 employees in the US and Central America, and over 270,000 square feet of manufacturing and warehouse space, we are proud to ship millions of garments to leading brands around the world.